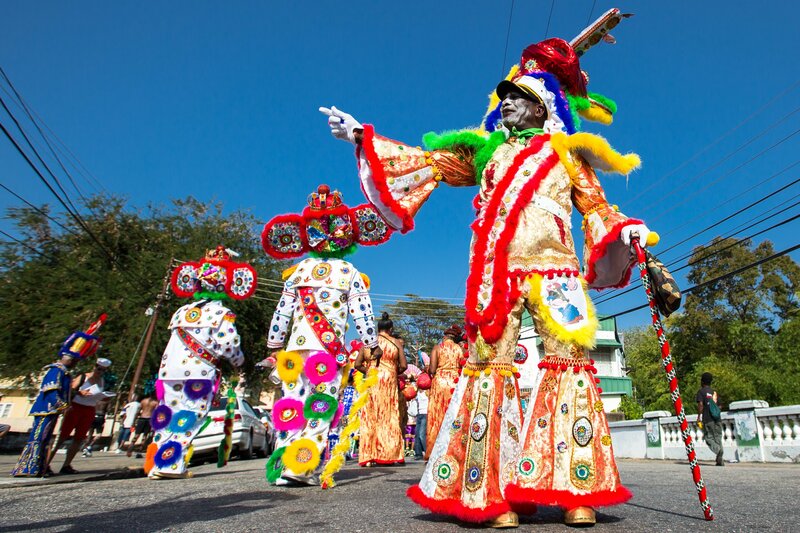 Mas is a reflection of Trinidad’s history, so it’s not surprising that sailor mas would make a big splash in Carnival. Sailor mas has thrived since its introduction in the 1880s, when British, French and American ships docked in Trinidad. Sailors proved perfect for the road. Simple costumes allowed people with modest incomes to feel part of Carnival and even later elevated some to the special realm of Free French Sailor, King Sailor and Fancy sailor. Free French sailors traditionally wear black berets with the name of the ship on the rim of the beret, tight-fitting short-sleeved bow-neck jerseys with blue and white stripes, and bell-bottomed, black pants and black shoes. King Sailors dress in white, with corduroy pants, a tunic with a sailor collar, epaulettes on each shoulder, a red sash across the chest and a crown of cords, medals and war ribbons. They carry walking sticks used in their dance routines. Fancy Sailors evolved from the King Sailors. They wear papier-mâché headpieces often made to look like some animal. They sport the decorations of a naval officer with ribbons, medals and braiding. Sailor mas includes various dances: the Bote, Crab, Marrico, Pachanga, Rock de Boat, Skip Jack and Camel Walk. Sailor bands are usually accompanied by steelbands and sailor mas is especially popular among schoolchildren – especially boys, who relish the idea of threatening spectators with baby powder. Reply to "Carnival traditions: Sailor mas perfect for the road"